Zodi is a wonderful mellow gal. 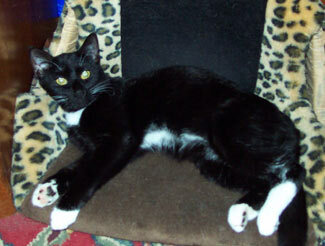 She's a small kitty who sometimes likes to keep to herself & other times is very affectionate & sociable. She has a peculiar penchant for nibbling on fingertips & finger nails. It's ok, it doesn't hurt. She also has a habit of forgetting to retract her tongue sometimes, which makes for cute pictures. Zodi usually has a little squeaky meow but sometimes she has the most mournful, sad-sounding meow I've ever heard. But she's not a sad kitty at all. 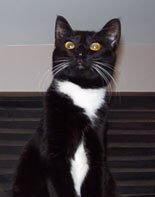 She's a friendly, easy-going sweetie who loves to chase strings & lounge on the porch.